I have been a drummer since the mid 1960s, and now it is 2012. So not quite half a century, but a heck of a long time. I have had quite a few drum sets over the years, originally acoustic and recently electronic. I play mostly in a jazz style, which you might assume would be better served by real acoustic drums and cymbals, but in practice, electronic drums are better for one simple reason, you can practice at low volume, or you can put on headphones and make the drums almost as quiet as a computer keyboard. Yes I know that an acoustic ride cymbal and snare drum can produce a billion sounds and nuances that don’t make it to the electronic version, if the listener is in proximity or if they are recorded well, but for most music, the electronics are good enough. I first became aware of the concept when I saw a grainy image on British television in 1971. The Moody Blues presented their drummer Graeme Edge playing what looked like a table, but sounded like drums. He had developed this in partnership with an electronics professor named Brian Groves. There were no microchips then so it ran on transistors. 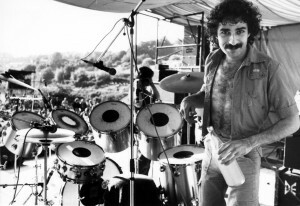 I never forgot it and as I toured Britain with a giant drum set all through the Seventies, I often wished I had a small and light alternative to my giant drums, which had to be mic’d up to be heard over the guitars anyway. The hardware for the kit and the mics weighed a ton. More than four decades later we still don’t have a lot more than the Moody Blues had on that one TV show. Here is a picture of it. Thank you Getty Images. 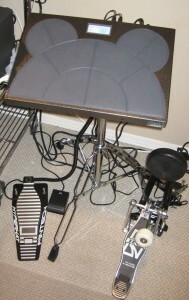 Electronic drums fall into two format categories, the format that mimics acoustic drums, and one-piece layouts. And there are two schools of thought that go with the two categories. 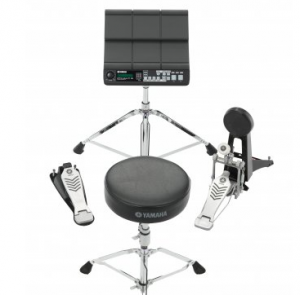 Purists and inflexible thinkers are proponents of having the electronic drum set take the same positions as the real set, and adaptable players might prefer to take advantage of the fact that electronic drums can be arranged differently. Let’s face it, originally kick drums with pedals evolved because the big drums required to make a bass drum sound with a foot movement had to be mounted on their sides. And Hi-Hats originally worked by having the drummer’s foot at the base of the stand where the pedal was. This in addition to the size and shape of stand mounted drums and cymbals formed what we now call the standard drum set. With electronic drums, these pedals can be anywhere. 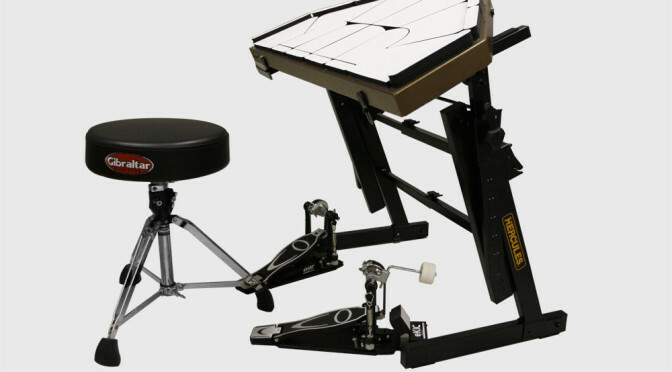 Well not quite, they need to be where the feet are in relation to the seat, but the playing surface can be anywhere, or even nowhere besides in the pedal itself. Similarly, while tom-toms measuring from ten inches to sixteen inches in diameter need to be a certain distance apart when they are part of a real drum set, their virtual counterparts can be small and close together, arranged to fall within a convenient small equidistant arc in front of the player. Again, our cymbals in electronic drum sets still replicate bow, shoulder, bell, edge etc., but they need not be arranged as such when they are rubber triggers. And while a right handed drummer typically plays the hi-hat with his or her right hand crossed over the left hand that plays the snare drum beneath it and to the right, with an electronic trigger, the hat can conveniently be beside the snare to the right, or to either side of the snare. It can be anywhere. I love this way of thinking about layout and I find that having drums arranged close together, all at a comfortable distance, height and angle from my seated position, allows me to play things that would be quite a lot harder on real drums or on a conventional electronic drum set that is arranged like acoustic drums. Unfortunately, one-piece electronic drums are quite disappointing. I am waiting for someone to bring out a better device. I have tried many different products, usually by purchasing, using and then reselling them. Currently I play an electronic drum set that is arranged like acoustic drums. 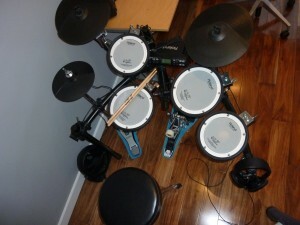 It is a Roland TD4-SX with mesh heads, and I have the pads arranged like an acoustic drum set. I own this because of my disappointments with one-piece electronic drums. It’s an entry level kit, but has nice quiet mesh heads and the basic sound module allowed me to customize and save a perfect sounding drum set, well almost perfect, the ride cymbal could be better. So, back to the one-piece sets. Here is my experience. Starting in 1996, I had been retired from playing for some years but saw a nice little toy called a Yamaha DD-50 in a consumer electronics store. The pads were very loud, being mounted on what was essentially a hollow plastic box, and they were rock hard rubber, which caused fatigue. Also it was so easy to miss the pad and get a loud crack when the stick hit the plastic. The pedals were little foot switches. I rigged one up to be hit with a real bass drum pedal, and that little set was fun, and it reminded me I could play. After another long break, in 2008, I wanted to play again and I started a marathon of flipping. I bought, played and sold several devices. 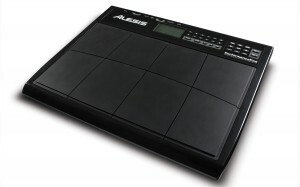 First was an Alesis Performance Pad. I found it was unable to keep up with a press roll, it had cross talk, which is where a pad is accidentally triggered by an adjacent pad, was acoustically loud due to it being hollow and having hard rubber, and the onboard sounds were not very good. 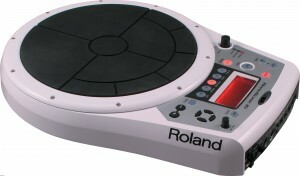 Second was a Roland SPD-20. The eight pad layout was far from ideal, and the onboard sounds were okay, but not great. I added a throne and pedals and even bought an amp. It did not inspire me. All were flipped. Then I put the sticks down in search of something really tiny, and played a Handsonic 10. This required the purchase of an audio interface because I recorded an album using it as a drum set. This was designed for hand and finger drumming and had limited choices for drum set sounds, but it was an excellent, high quality device that still has no equal. I knew that playing it with sticks would damage it so I never did. I learned new techniques and all it really lacked was the ability to do real rolls, which require the player to use sticks. Hand drumming was interesting, but I am a stick drummer, and the sticks were beckoning again so I flipped the Handsonic and bought a Yamaha DTX-Multi 12. This was not very playable so I promptly returned it for a refund. (Thanks Zzounds). Then I bought a DrumKAT DK10. It was a little trickier to set up because firstly, it had no onboard sounds, so I had to buy a sound module and a few pricey cables. It apparently did not have a continuously variable Hi-Hat, which is something I need as a jazz drummer, but it felt nice. Yes it was a little loud in the room and the pads were hard enough to give me some fatigue, but it was not too difficult to master the unconventional interface and I quite liked it. I got sounds either from the Roland sound module (an old TD-6 model) or via EZdrummer or Garageband on my computer. I exchanged it, or upgraded it through the American manufacturer and got a more complicated model with continuously variable Hi-Hat, called a DrumKAT 3.8. This was the one that defeated me. I found I was not quite able to master the control interface. Alternate Mode, the manufacturer were such wonderful, ethical sellers, and they graciously allowed me to return it for a refund. Ironically, it was later discovered by Alternate Mode’s President that all my woes had been caused by a faulty hi-hat pedal controller, not made by Alternate Mode. What I really wanted to be playing was a TrapKAT XL. I am pretty sure that if I had one, and some help setting it up, I would love it. I may in fact be buying one soon to replace the Rolands. This is the closest anything has come to the dream one-piece, and considering it is American-made by a small firm, the price is not bad at all. The operating system and absence of a big display screen can prove challenging for some, and that would include myself. A fresh start in this area would help them take these excellent controllers mainstream. Imagine a TrapKAT with a docked tablet interface running VSTs! At some point during this flipathon, I also briefly had an Alesis Control Pad that I used to trigger MIDI drum sounds, but it was as hard on the hands as the Performance Pad, and the quality was not confidence inspiring, so I flipped that also. So eventually I gave up, temporarily I hope, on my one-piece dream and bought my Roland drum set, which plays beautifully. And it should be noted that you get a lot for your money when you buy an electronic drum set. One-pieces are expensive by comparison, especially when you add the pedals, stand, sound source, etc. Update, April 4th 2012: A new all-in-one solution has hit the streets in April 2012. The TrapKAT 5KS is a TrapKAT XL with an onboard Kurzweil sound synthesizer. 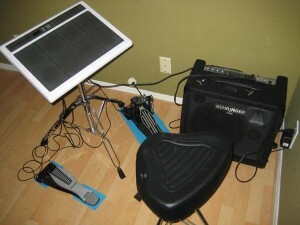 It is available at alternatemode.com and is being billed as a 26 piece plug and play eKit. I will call it a one-piece. I’ve ordered one. Update July 11th. 2013: That TrapKAT 5KS allowed me to play brilliantly. The layout was perfect, but I returned it after 3 weeks because I strongly disliked the built-in sounds and because for the price, there was too much wrong with it. It needed a programmer to come in and adjust levels, curves and other things that I did not wish to learn about. The TrapKAT is brilliant, but made for engineers, not drummers. It is like working with a prototype for a future device. It was brilliant and totally frustrating at the same time. So until Yamaha (or Roland) make something like a TrapKAT, I placed my one-piece dreams back on hold and got a Yamaha set, with a DTX-700 module. I love it, but I still want a one-piece. Jeffrey the Barak used to be Jeffrey the Barak in the 1970s. He still is to some degree. His music is too dangerous to include here. PreviousPrevious post: Scoot Like a Pro! I still play an acoustic kit, but love the Trapkat(older steel housing, gum rubber pads),run 4 pedals for dual bass/dual hats, or 3 bass/1 hat config. It is totally cool,on a custom riser.Pix posted on the am website. I still use hardware(yamaha dtxtreme 2) ,will look forward to a laptop/softsynth when they sound better,and are easier to use. Thanks for the post. I identify with so much you have written and have followed a similar, tortuous journey to find an ideal (and portable) playing solution, albeit as a not-so accomplished drummer. Built my own edrum set at first with a module kit and piezo rigged pads. Upgraded that to a Roland TD-8 module and acoustic -to- electric converted drum shells which were excellent at triggering but far from portable on a frum rack complete with cymbals. Then my journey to compact pads started. A drumkat 3.8 was first and it was lot of fun and very portable but I wanted more pads. I located a steel trapkat and again, had a whale of a time with it but it was trickier to transport on its rack than I liked (but I couldn’t afford the new lighter XL version). Bought a Zendrum which is the ultimate in portability when merged with VSTi’s and is great to play with supreme sensitivity. I still have it. Then I bought the Handsonic HPD15 but was disapppointed with the onboard samples for a quick trap set so upgraded to an HPD 10 for the better sounds. Found myself preferring to play through a laptop with drum samples for a drumkit so got frustrated at the limitations of playing with hands. Started looking for a kit that I could play with sticks again and landed on the Yamaha DTX Multi 12 which I am currently tweaking (whilst using a self built pad for the snare). Underwhelmed by the feel of the pads but like the uploadable samples you can add to the memory, but still mainly trigger vsti’s with it. Need a bit of work to get it to my liking for playing style still. And all the while I still think back to the fun of playing with a drumkat / trapkat – maybe there is still another step on this journey…. @Dave. Sound like you and I are both flipping gear like crazy to find what we want. I think I may grab a new TrapKAT XL actually. I crave the large one-piece layout and the new Nu Bounce playing surface is supposed to be excellent. But now I am wondering if I can be satisfied by with a normal Yamaha/Roland type sound module or if I have bee spoiled by the more natural sounds that computers can now give us. What a carry on! I made a whole album using a HPD10 (search on the-vu for “That’ll come in handy”) and it sounds quite like a drum set to me, but I missed my sticks so much, and wanted a better sounding kit. I like real-sounding drums for playing jazz and I don’t like the majority of module sounds that sound like amplified rock kits or electro-kits. What a situation! @Frank J. I’ve seen your custom riser and stand on the A.M.site. Very clever!. Thanks for the comments, fellow gear flipper. Thanks for sharing your eJourney. Really informative. I too am an old fart (55) and an done with the schlepping! I have a multi-12 — agreed, not too great w/sticks but great fun w/hands and a nice addition to my kit. If you’re familiar with Phil Collins/Genesis, the song “I Can’t Dance” features an electronic drum kit, the Simmons SDX. To me, electronic can sound every bit as good as a physical set. Another update, June 2nd 2012. Well I returned my TrapKAT. They are still not ready for me, far too complicated to set up and control. I now have a new Yamaha drum set (DTX-535K) and actually, once the pads and cymbals are in the bag and the rack is folded, its not any harder to transport than the KAT setup. I put it to Mario in an interview published in the Feb 2014 edition of digitalDrummer that some say his products are hard to program. powerful and easier at the same time. I own 2 older trapkats without the sounds and I would not trade them for anything. Really confused about your comments about programming difficulties. They have preset kits that work with every drum machine/module on the market. it’s literally plug and play . You can train it to your own playing style in about 5 minutes tops. I think this may have been a case of you making it much more difficult than it actually is. in any event, anyone slightly interested should give them a try . I’ll never go back to acoustics!!! My TRapKAT 5KS (module built in) was quite simple once I got a working power supply and ignored any decal over any hole etc. (they were not accurate), except I only ever found the standard kits and could never navigate to all the sounds the manual referred to. And my DrumKAT DK10 was simple to use with a module, although I had some manufacturing quality control issues. It was a more advanced DrumKAT (I think it was called a 3.5) that was the opposite of simple. I could not even get it set up and so I returned it. I still maintain that the user interface should be redesigned from scratch and the overall quality and reliability was not up to today’s standards. Thanks for your comment though. I won’t go back to acoustics either.